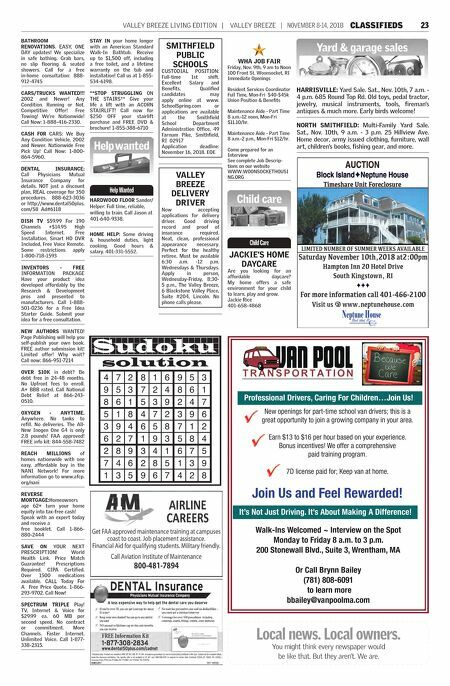 22 CLASSIFIEDS NOVEMBER 8-14, 2018 | VALLEY BREEZE | VALLEY BREEZE LIVING EDITION To advertise call Donna 401-334-9555 GREENVILLE CENTER 735 Putnam Pike, Greenville, RI 02828 If interested, please contact: Robin Dupont, Human Resource Manager 401-949-1200 ext. 349 or robin.dupont@genesishcc.com CNA All Shifts EOE Now accepting applications for delivery driver. Good driving record and proof of insurance required. Neat, clean, professional appearance necessary. This is a part-time one day per week position. Must be available 7 a.m.-12 p.m. Wednesdays & Thursdays. Apply in person: Wednesday-Friday, 8:30 a.m.-5 p.m., The Valley Breeze, 6 Blackstone Valley Place, Suite #204, Lincoln. No phone calls please. 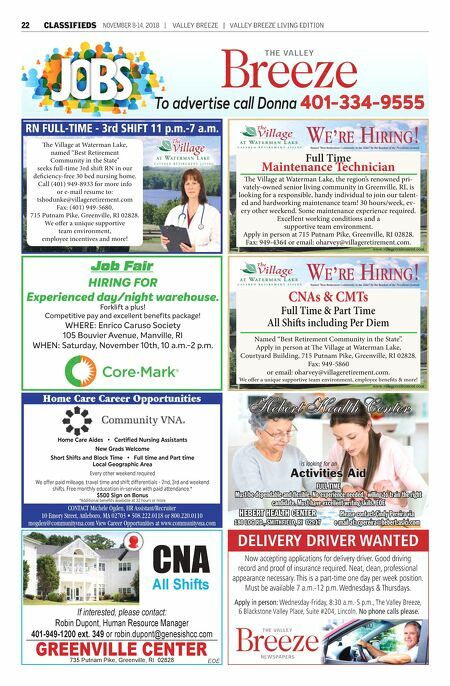 DELIVERY DRIVER WANTED Home Care Career Opportunities CONTACT Michele Ogden, HR Assistant/Recruiter 10 Emory Street, Attleboro, MA 02703 • 508.222.0118 or 800.220.0110 mogden@communityvna.com View Career Opportunities at www.communityvna.com Home Care Aides • Ceified Nursing Assistants New Grads Welcome Sho Shis and Block Time • Full time and Pa time Local Geographic Area Every other weekend required We offer paid mileage, travel time and shi differentials - 2nd, 3rd and weekend shis. Free monthly education in-service with paid a•endance. * $500 Sign on Bonus *Additional benefits available at 32 hours or more Hebert Health Center is looking for an Activities Aid FULL TIME Must be dependable and flexible. No experience needed, willing to train the right candidate. Must have excellent writing skills. EOE Please contact Cindy Pereira via e-mail at: cpereira@hebert.aslci.com HEBERT HEALTH CENTER 180 LOG RD., SMITHFIELD, RI 02917 HIRING FOR Experienced day/night warehouse. Forklift a plus! Competitive pay and excellent benefits package! WHERE: Enrico Caruso Society 105 Bouvier Avenue, Manville, RI WHEN: Saturday, November 10th, 10 a.m.-2 p.m. Job Fair CNAs & CMTs Full Time & Part Time All Shis including Per Diem Named "Best Retirement Community in the State". Apply in person at e Village at Waterman Lake, Courtyard Building, 715 Putnam Pike, Greenville, RI 02828. Fax: 949-5860 or email: oharvey@villageretirement.com. We offer a unique supportive team environment, employee benefits & more! RN FULL-TIME - 3rd SHIFT 11 p.m.-7 a.m. e Village at Waterman Lake, named "Best Retirement Community in the State" seeks full-time 3rd shi RN in our deficiency-free 30 bed nursing home. Call (401) 949-8933 for more info or e-mail resume to: tshodunke@villageretirement.com Fax: (401) 949-5680. 715 Putnam Pike, Greenville, RI 02828. We offer a unique supportive team environment, employee incentives and more! Maintenance Technician Full Time e Village at Waterman Lake, the region's renowned pri- vately-owned senior living community in Greenville, RI, is looking for a responsible, handy individual to join our talent- ed and hardworking maintenance team! 30 hours/week, ev- ery other weekend. Some maintenance experience required. Excellent working conditions and a supportive team environment. Apply in person at 715 Putnam Pike, Greenville, RI 02828. Fax: 949-4364 or email: oharvey@villageretirement.com.